You operate a restaurant or nightclub establishment. Serving alcohol to minors is a serious offense, not only costing you huge fines, but opening you up to huge liability lawsuits. LicenseID is a sophisticated yet simple to use application for use in nightclubs, restaurants, or any place that instant, qualified validation of age is required. It is used in conjunction with a standard magnetic stripe (Track 2) card reader to read the stored information on a standard driver's license, and instantly identify those patrons who are underage. As well, it displays the information stored on the magnetic stripe of the card, to allow your employees to confirm the information against that shown on the front of the card. You want to get your customers into your establishment as quickly as possible. Nothing is more off-putting to a potential customer than seeing a long line waiting to enter. LicenseID allows your door personnel to quickly and securely verify age of majority, to allow your customers quick entry. 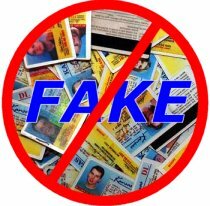 LicenseID can just as easily be run behind the bar, where dim lighting and noise is not conducive to proper verification of ID. A quick swipe of the customer's drivers license, and your bar personnel can confirm that your customer is of age. LicenseID is offered in a time-limited fully-functional trial version. When you purchase LicenseID, you will be given a registration code which unlocks your copy and removes the time-limiting function. LicenseID runs in the foreground, waiting for use. When a patron's driver's license is swiped through the card reader, LicenseID reads the information from the card, and determines whether the patron is of age for entry into the establishment. As well, LicenseID can identify those customers who qualify as seniors, to make sure you treat your senior customers with the respect (and the discounts!) that they deserve, without the embarrassment of asking their age. LicenseID uses industry-standard magstripe readers, using keyboard wedge or RS-232 connectivity. LicenseID works well with Magtek readers, but conforms to industry standards, and should work with any compliant reader. Card readers which operate with LicenseID can be purchased at low cost online at places such as eBay. LicenseID is fully customizable to allow for different age ranges, languages and many other options. LicenseID is Copyright © 2004 Hollsco Group.